-Read the excerpt below from Simon Plosker's post at HonestReporting.com. Unfortunately, the inconclusive negotiations have given an opening to the Israeli prime minister, Benjamin Netanyahu, who excoriated the proposed agreement as the “deal of the century” for Iran before it is made public, to generate more hysterical opposition. Netanyahu has pointedly not opposed negotiations with Iran. But he is entitled to express his legitimate concern and to oppose any deal that may leave the threat of a nuclear Iran hanging over Israel like a proverbial sword of Damocles. But why does the NY Times believe that Netanyahu is responsible for generating “hysterical opposition?” The term would imply some sort of irrational behavior and perhaps is indicative of the NY Times’ general disdain for the Israeli prime minister. 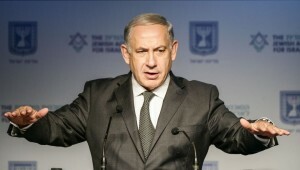 Even Time Magazine, also not known for its favorable treatment of Netanyahu, acknowledges “even if Netanyahu has worn out his welcome, some of the West’s leading experts on nuclear proliferation are making much the same case,” before quoting Olli Heinonen, a former deputy director of the UN’s International Atomic Energy Agency, now at Harvard, and David Albright, an American former IAEA inspector, who runs the Institute for Science and International Security, the Washington think tank that does the most-quoted independent research on Iran’s nuclear program. Does the NY Times also believe that two former IAEA inspectors are also “hysterical?” Or is the only hysteria the NY Times’ apparent desperation to see an Iranian deal signed at almost any cost? 1. In his post, Mr. Plosker writes: “Israeli Prime Minister Netanyahu has pointedly not opposed negotiations with Iran. But he is entitled to express his legitimate concern and to oppose any deal that may leave the threat of a nuclear Iran hanging over Israel like a proverbial sword of Damocles.” Do you agree with this assertion? Explain your answer. 2. Mr. Plosker also says: “But why does the NY Times believe that Netanyahu is responsible for generating ‘hysterical opposition?’ The term would imply some sort of irrational behavior and perhaps is indicative of the NY Times’ general disdain for the Israeli prime minister.” Does Mr. Plosker have a valid point? Explain your answer. 3. The Iranian government has expressed their desire for the destruction of Israel on numerous occasions. Their secret nuclear weapons program was discovered in 2002. Since then, they have given the international community the run-around on allowing nuclear inspectors in to their facilities. Why do you think the NY Times editors would say that Prime Minister Netanyahu is “responsible for generating ‘hysterical opposition? '” over this life or death matter for his country? Questions #1, 2 and 3 are all opinion questions. Answers vary.